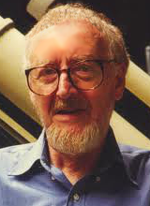 Richard Hall was born December 25, 1930, in Hartford, Connecticut. When the Korean War was imminent, Richard enlisted in the USAF in 1949 and served into early 1951, followed by six years in the Air Force Reserve. He returned to civilian life in 1954 and enrolled at Tulane University, New Orleans, Louisiana. Originally a mathematics major, he later switched to a major in philosophy with a minor in mathematics and graduated in 1958. During 1957 he joined NICAP and was subsequently hired as a part- time office assistant by Donald E. Keyhoe. The pay was modest, but as Hall recalls, "The prospect of receiving any salary at all for investigating UFOs was irresistible." Sometime during late 1958 or early 1959, it was discovered that NICAP's office manager had issued honorary NICAP membership cards to several contactees . Apparently this had been done without proper authorization and was against the grain of NICAP's view on the contactee issue. Consequently, the existing office manager was replaced by Hall, who became a full-time NICAP employee. Hall worked for the organization for about 10 years and participated in the preparation and coordination of NICAP operations. Hall was directly involved with NICAP's submission to the Condon Committee. Major Keyhoe and Richard Hall were both invited to brief the Committee and there were a number of meetings and exchanges of information between November 1966 and December 1967. However when the Committee failed to provide any assurances that NICAP's data was being taken into consideration, NICAP began disancing itself from the Committee. Later it was learned that NICAP's concerns were fully justified. Hall left NICAP in September 1967 to seek a higher paying job that could support his new marriage. For about seven months he worked for a Washington, D.C., area trade association, but found the culture shock too stressful and returned to NICAP where he worked part-time from July 1968 to July 1969. In August 1978, Hall and Dr. John B. Carlson, an astronomy professor at the University of Maryland, learned that NICAP was in serious financial trouble. Together they formed the Ad Hoc Committee to Preserve NICAP. In an effort to prevent NICAP files from falling into the wrong hands, they proposed various resolutions, including an offer to take possession of the files in case of bankruptcy. They also explored the possibility of affiliating NICAP with MUFON or CUFOS, or forming a combined umbrella group to pool resources. Ultimately NICAP dissolved in 1980 and its archive of UFO sighting case files was purchased by the Center for UFO Studies. Uninvited Guests: A Documented History of UFO Sightings, Alien Encounters & Coverups. Aurora Press (1988).